Try and say that 10 times fast! 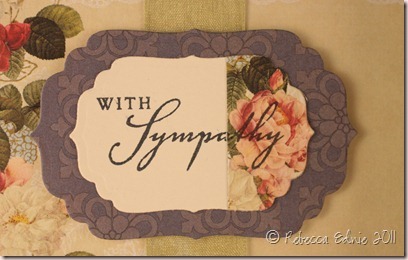 Sharon Johnson posted a super simple sympathy card this week using Webster’s Pages paper as a background. Those papers have so much going on, you don’t need to add much else. What a great idea as I hate spending time making sympathy cards; I care but it’s a bit morbid especially when you make them in advance. On the right is the most embellished one I made. It has the little flowers and a button in addition to the die cut sentiment panel and the ribbon. The one on the left has no embellishments other than ribbon but it has some patterned paper on the die cut. The best part is that I made two of the purple cards; all I used for paper was a single sheet of vintage violet cardstock (cut in half), two sheets of DP and scraps of ivory cardstock as the purple die cut used the remainder of the paper I cut off from the 6×6 sheet. The button was threaded with a tiny strip of paper! I raised the die cuts on foam dots. I couldn’t find a tiny leaf to add to the small flowers so I used a green button instead. This one is the simplest card. No embellishements with a style and colour combo which are definitely more masculine. 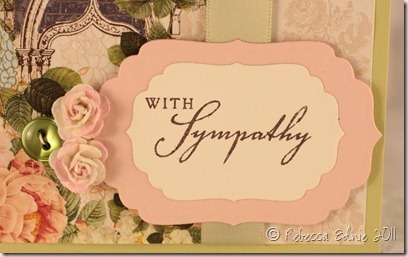 Yeah, it has flowers on it and I would never usually send a card with flowers on it to a guy but have you ever looked at store-bought sympathy cards? Mostly flowers or landscapes so I think it’s OK. This one is going to the Renz family. So sad. The others are for my stash. 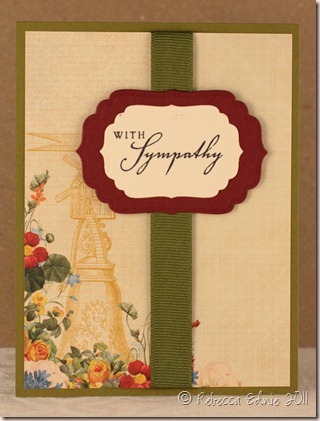 I am going to make up a small folder of thank you, sympathy and get well cards to keep in my car. I am ALWAYS forgetting to write out cards ahead of time and as I drive to visit someone or get close to church, I remember then. So this will let me still give cards despite my terrible memory! This must be the shortest recipe ever! I love CAS cards… sometimes. 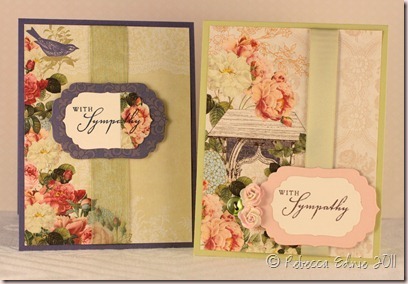 Beautiful Sympathy cards Rebecca! Love the pretty patterned papers you used!